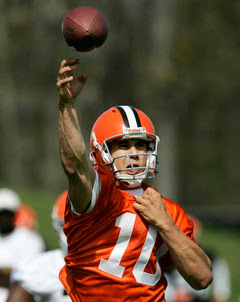 ---Brady Quinn and the Cleveland Browns agreed to a five-year contract this morning, ending the holdout of the No. 22 pick in the draft. He missed 15 practices. The deal guarantees Quinn $7.75 million. According to a league source, the total package could approach $30 million if Quinn triggers all the escalators in the deal. Quinn is making arrangements to get to Cleveland from Phoenix, where he has been working out during his holdout. If nothing else right now, this is a good PR move as the Browns head into the preseason. Although you have to wonder if Quinn would be penciled in at starter if he'd reported to camp on time. This isn't '99 when Couch was thrust into the role behind an awful offensive line. On paper at least, the current o-line is probably the most improved position on the team. What's more, Frye and Anderson haven't exactly sparkled during camp. All that being said, we all know how Romeo feels about playing rookies, and Quinn struggled during minicamps. All I know right now is this: A.J. Hawk's brother-in-law has a lot to prove.